Higher rev players and those with slower speeds are going to love the Capacitor Core as it is a true-rolling masterpiece. Pure predictability at its finest, this design makes you the ultimate master of your ball motion. The higher RG, lower differential will give the bowler a long and smooth roll on tougher conditions. Controll Urethane is the perfect choice when battling the oil-less environment. When there is too much friction on the lane, urethane has become the gold standard for ultimate control. Whether it is a short pattern or wood lanes, every serious bowler needs to have a urethane in their bag for when that moment arrives. A microscopic view of the smooth terrain of the Controll Urethane Coverstock. This ball has a very controlled motion, it is consistent shot after shot. It hits hard! A great go-to option on third game situations or once the lanes break down. I throw 15mph with moderate revs, with this ball I can keep my shot straighter and repeat without much effort. Highly recommended! Being a two hander with over 500 revs, this ball is absolutely perfect for almost any condition. Once the lanes start to breakdown, all I have to do is make minor adjustments and I’m totally lined up with it. This ball is simply easy to handle ??????? I am a left handed bowler with a lot of hand. I just brought the Pitch Black a month ago. It is my first urethane bowling bowl and I love it. This is a good ball for straightening out the lanes. It is predictable and easy to handle. I know that the Fever Pitch just got released to the public on 22 February 2019, but after having the Pitch Black I am really considering adding the it to my bag. Just bought this ball and rolled my fifth perfect game in only the second game I use it in league. I’d been struggling to bowl well with today’s high performance balls due to my slower ball speed and ball overreaction. I feel this ball is so much easier to control than any I’ve used in many years. Glad I added it to my arsenal! I love this ball! This urethane ball really delivers when it hits the pocket. My average has gone up each of the two plus years I have been using it. My bowling has really improved, never thought I'd be a 200+ average bowler. All credit to the power of urethane and PITCH BLACK! I am a two-handed bowler with 550 rpm and medium to high ball speed. I love to use the pitch black at the first arrow with 4000-grit pad. It hits the pocket with strong power, and never let med down.Everyone needs this ball! I never thought I would be saying this about a urethane ball but this ball is a beast, a beast I tell you. 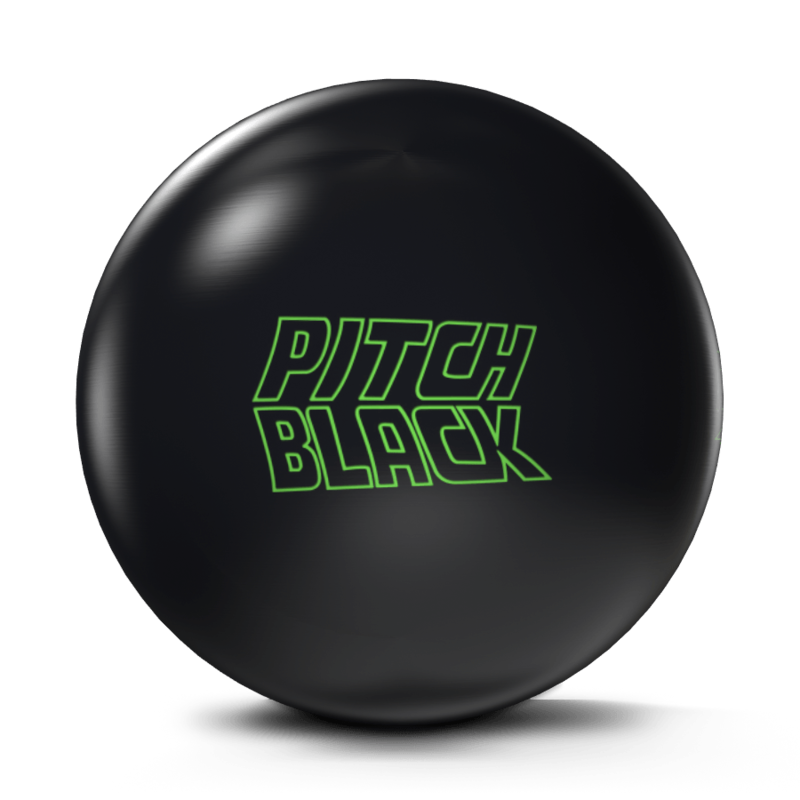 When the lanes beak down and are dry to medium, break out your pitch black and witness the power. Hits harder than any ball you have. Creates lots and lots of pin action. If you don't get one your bad. From the first moment I threw this ball, I knew it was going to be a game changer. I drilled mine with pin above ring finger with the CG kicked out two inches left. I am a two handed bowler so this ball has allowed me to play right on burnt THS and still offering enough backend with 500 abralon to be used on medium to heavy oil. What really sold me on this ball was the continuation it delivers through the pins, keeping them low to the deck but still providing carry. I recently bowled my first 300 with this ball so it definitly has earned a spot in my bag. Go pick one up to day! Stde an amazing product that would fit in anyone’s arsenal! I must say this is one of the best balls that I have in my bag. Its very good when the lanes break down dramatically or you are struggling to bowl on dryer or short lane conditions. With a slight adjustment to the surface ( 800 grit pad) I am able to hit pocket when my other storm balls seem to be having trouble due to over hooking or being overly aggressive. ( mostly going high). Very controllable ball. The highest game I shot with this ball is 288 and is always a go to ball when the lanes get tough and tricky. Its a never fail. Thank you storm for making this ball and for bringing back yesteryear technology.